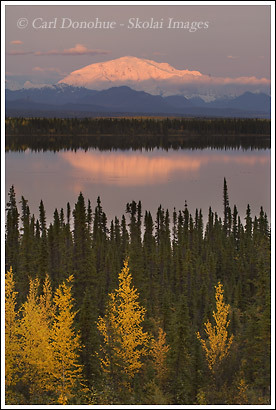 This image will be my last one from Wrangell St. Elias for a little while. Well, that’s the plan, anyway – that’s highly likely to change as I get even more excited about heading back to the park this coming summer. This photo was taken from the Richardson highway, looking east towards Wrangell St. Elias National Park, at Mt. Blackburn. There’s a pull off on Richardson highway that affords a view of Mt. Blackburn (16,390 feet = 4,996 m), Mt Sanford (16,237 ft = 4,949 m), Mt. Drum (12,010 ft = 3,661 m), and Mt. Wrangell (14,163 ft = 4,317 m) in the early fall, September 2006. There’s probably no better view of big mountains anywhere in North America. With Wrangell St. Elias National Park easily being home to the greatest mountains in North America, it comes as no surprise such a view would be here somewhere. I took this photo after a summer of rainy, cloudy, dreary, cold, wet, nasty weather. Mid-september rolled around and we had a few nice days. 2, I think. So I took advantage of the cool clear air to shoot as much as I could. After spending on emorning and evening shooting some aerial stuff, I looked for some other landscapes. This one was late in the evening, catching the alpen glow on Mt. Blackburn from Willow Lake. Mt. Blackburn’s simply an awesome mountain. Even sitting in a range like the Wrangells it still dominates everything around it. There’s not too many places where we can get a great view of it in good light, but Willow Lake is one of my favorites. Most of the better places to view this mountain are from its south face. The problem with that, of course, is that this far north it means you don’t get great light on the mountain (in the summer months). There’s not many places you get a great view of Mt. Blackburn from the north, so most images we see of this mountain are from the southside. More photos of Wrangell St. Elias. This entry was posted in Alaska, Landscapes, Travel, Wrangell - St. Elias National Park on May 2, 2007 by Carl D.
Wonderfully balanced shot Carl. Not too shabby.